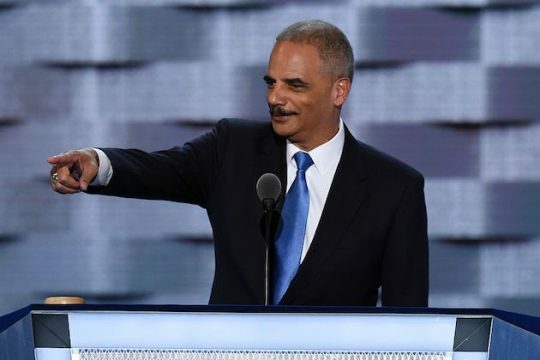 The National Democratic Redistricting Committee (NDRC), an effort spearheaded by former Obama-era Attorney General Eric Holder, is claiming victory in several states targeted for a barrage of outside spending by a 527 group led by billionaire activists George Soros and Tom Steyer. The NDRC believes one of the reasons Republicans have enjoyed a lengthy majority in the House of Representatives is because of gerrymandered house districts. Because state legislative bodies usually draw house districts, the NRDC was trying to elevate some of these elections by putting a national veneer on races that usually come down strictly to local politics. Drawing new house districts will begin again after the completion of the 2020 census, which is why the NDRC is making such a strident push now in what they call a "fight to shift the balance of power away from Republicans before redistricting occurs in 2021." After the election the NDRC's website boasted, "We won governors' races in 8 states: Colorado, Maine, Michigan, Minnesota, Nevada, Pennsylvania, Wisconsin, and Virginia (in 2017.)." The website further claimed, "We flipped 6 legislative chambers: Colorado Senate, Maine Senate, Minnesota House, New Hampshire House and Senate, and the New York Senate." Nearly all of the states mentioned were the select spending targets of State Victory Action, a 527 fund established just this year, and which was overwhelmingly funded by Soros, Steyer, and to a lesser extent, Donald Sussman. Representatives with Steyer, Soros, as well as the NDRC did not return requests for comment, including questions about whether there was coordination between State Victory Action and the NDRC. For an example from the list on the NDRC's site, Democrats (technically members of the Democrat Farmer-Labor Party) won a majority in Minnesota's state house of representatives. Using a pass through committee, State Victory Action donated millions to Alliance for a Better Minnesota. Alliance for a Better Minnesota then spent between $7,000 to $10,000 each in 17 house races in online ads for the Democratic Farmer-Labor candidate, 11 of which were identified as "Battleground races" by the website Ballotpedia, and won most of them. Many of the house races in Minnesota average only about $40,000 to $50,000 in total fundraising and spending by the candidate’s own campaign committee, according to data compiled by Ballotpedia. For an overall comparison, State Victory Action pumped about $1.8 million into the Minnesota governor's race as well as state house and senate races. The NDRC, however, contributed only $124,000 to all of those efforts combined, according to Federal Election Commission data reported in late October. State Victory Action was also active in New England, where the NDRC boasted about flipping the balance of power in three chambers: the Maine senate and New Hampshire's house and senate. As the Washington Free Beacon reported before the election in October, State Victory Action had contributed about $500,000 to local political committees in Maine, and roughly $400,000 to local groups in New Hampshire. FEC data shows no activity for the NDRC in either of those states. State Victory Action was also active in Nevada, New Mexico, and Colorado, all of which were listed in the "win" column by the NDRC, but were states in which the NDRC did not make contributions. State Victory Action, however, was not always active in every state eyed by the NDRC. For example, available campaign finance reports do not indicate that State Victory Action does not appear to have donated to any state-level races in Wisconsin, while the NDRC did at least make contributions of about $45,000. The NDRC also donated $500,000 in North Carolina, a state which State Victory Action mainly avoided. This entry was posted in Politics and tagged Eric Holder, George Soros, Redistricting, Tom Steyer. Bookmark the permalink.